Introducing Uncertainty Principle No. 3 — Nickel Brook Brewing co.
Our latest Funk Lab creation has arrived! Uncertainty Principle No. 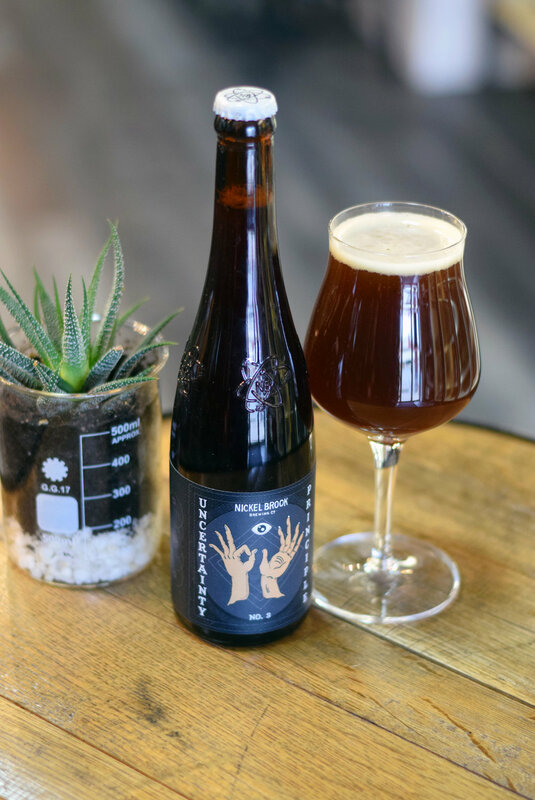 3 is a Fruited Sour Barrel Blend that is deliciously complex and unique. A selection of Niagara wine barrels were filled with a mixture of Flanders Red and Brown ales, and aged for 2 years in our barrel house. After allowing the brew to mature in barrels, our brewers later blended in Niagara Peaches and wild yeasts. Pouring a vibrant orange with an off-white frothy head, notes of dark wood and mahogany gently guide the aroma into stone fruit character, notable from both the 'Niagara Peaches' and the Flanders yeasts. Light tartness leads to a wonderful amalgamation of bright peaches and Belgian candi sugars on the finish. Available December 15th at our Tap Room & Bottle Shop, and online. Announcing the 2019 Funk Lab Series!